The Washington Spirit signed Estefanía Banini prior to the 2015 season, where she had previously played with Chilean club Colo-Colo from 2011 to 2014, where she helped her team win the Chilean Women’s Football Championship each season. 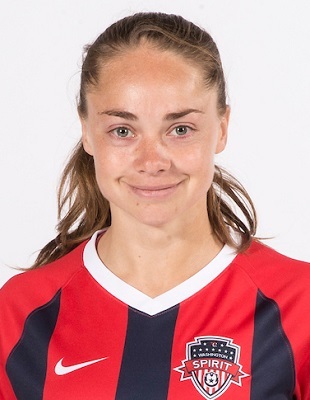 2017: Banini’s return to the Washington Spirit was announced on June 19, 2017, following a brief stint with Spanish club Valencia… Appeared in nine games for the Spirit, totaling 546 minutes… Scored one goal. 2016: Played 13 regular season matches, 9 starts, totaling 888 minutes…started both postseason matches…scored five goals earning the Spirit Golden Boot…recorded one assist…won NWSL Goal of the Week for Week 13, NWSL Player of the Week for Week 13, and NWSL Player of the Month for July. 2015: She played and started in the first four games of the season before sustaining an injury which sidelined her for the rest of 2015. Argentinian National Team: Currently plays internationally for Argentina… Her first international match was in 2010 … In 2014, she scored a penalty kick in Argentina’s 2-0 win over Brazil during the Copa America tournament.